188 pages | 4 B/W Illus. Worlding multiculturalisms are practices that infuse our arbitrary cultural lives with new things from other cultures in poetic ways to enable us to dwell and be at home with the complexity of the world. 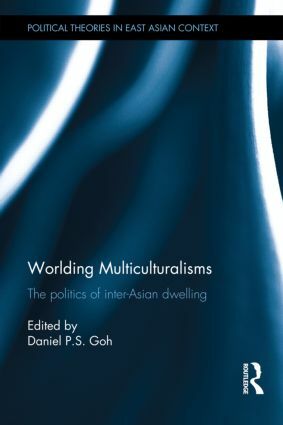 In the context of the crisis of multiculturalism in the West and the growing obsolescence of state-based multiculturalism in the postcolonial world, this book offers examples of new practices of worlding multiculturalisms that go beyond issues of immigration, integration and identity. Contrasting Western and Asian notions of multiculturalism, this book does not focus on state issues, but rather, highlights manifestations of cultural exchange. The chapters draw on cultural studies approaches to document instances of worlding multiculturalisms that bring Asian cultures into conflict, dialogue and settlement with each other. Instances include an Asian American return novel set in Penang, the cultural productions and street performances of democracy marches in Malaysia, the campaigns to reclaim public spaces and citizenship rights by migrant domestic workers in Hong Kong, the imaginary vistas opened up by Japanese popular culture consumed throughout Asia, the localisations of casino complexes in Macau and a shopping mall in Seoul, and an old municipal cemetery being defended from urban redevelopment in Singapore. Rather than merely globalizing forms of political diversity, these are instances with the potential to transform social relations and the very terms of cultural exchange. Worlding Multiculturalisms offers a truly interdisciplinary examination of multiculturalism in action. As such, it will appeal to students and scholars of cultural studies, Asian studies, Asian culture and society, cultural anthropology and sociology and political sociology. Daniel P.S. Goh is Associate Professor at the Department of Sociology, National University of Singapore. Political Theories in East Asian Context aims to shed light on the essential theoretical issues spanning East Asia by situating them within cross-cultural frameworks that attend both to the particularity of East Asia as well as the potentially　universal patterns arising from East Asia’s current issues that can be studied for the global prosperity. It reconsiders issues like historical reconciliation, nationalism, multicultural coexistence, political leadership, republicanism, and regional integration, with a view to opening the discourse of particular issues to a wider theoretical horizon. Including　intellectuals in the field of political science, history, ethnic studies, sociology, and regional studies, this interdisciplinary endeavor is a deliberative forum in which we can reflect on ethical problems facing East Asia in the global era.